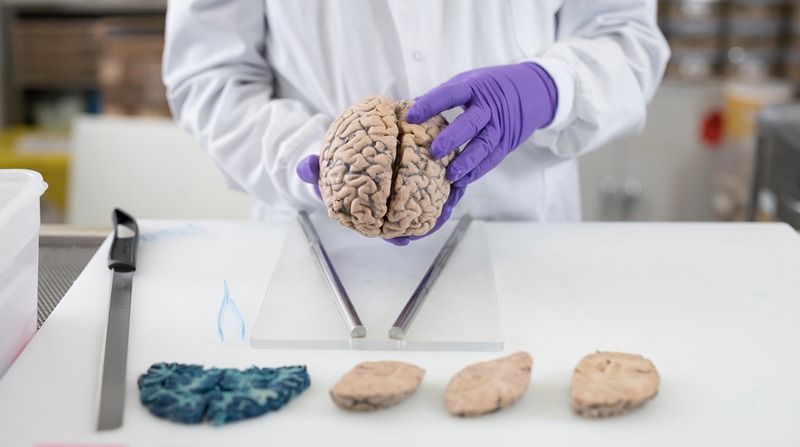 For World Parkinson’s Day, Ben Tilley highlights how brain tissue donated to Imperial’s Tissue Bank is instrumental in finding new methods of treatment for Parkinson’s. My personal journey with Parkinson’s disease (PD) research started six years ago. It was the summer of 2012, and while enjoying the London Olympics and preparing myself to start Medical School at Imperial College London, my father was developing symptoms of PD. When the diagnosis was made I knew what my career goal would be; I had to study this disease and I had no ambitions other than to become a neurologist in the future. As an early career Parkinson’s researcher at Imperial, one of the most exciting opportunities is to be able to work with the tissue collected at the Imperial-based Multiple Sclerosis and Parkinson’s Tissue Bank, funded by Parkinson’s UK and the MS Society. All the brain tissue collected is thanks to the incredible generosity of over one thousand donors and their families (and counting). The Tissue Bank is a phenomenal resource – the largest of its kind in the country – and a treasure chest that is just waiting to be unlocked by researchers willing to ask the key research questions to address features of the disease that are the most distressing to those affected. It would be a mistake to think of PD as purely a disorder of movement. Of course, it is true to say that the tremor (shakes) and classical walking disorder are among the most noticeable features, and often a source of stigma and embarrassment for some patients. The patients I have had the honour of knowing and studying over my time as a researcher commonly attempt to hide their symptoms by putting their shaking hands in their pockets. However, some of the most damaging symptoms of this multisystem disease are not visible to the lay observer. One such symptom (or set of symptoms) is cognitive impairment. This is a common complaint for PD patients, with up to 40% developing dementia during their disease. Naturally, the word ‘dementia’ scares patients and family members alike, and there are precious few treatments available to patients once they reach this damaging stage of their disease. Researchers have grappled with this issue for decades, attempting to find biomarkers and risk factors for dementia in PD in order to try to intervene early. It is hoped that early intervention could provide opportunities for halting cognitive impairment in its infancy. Moreover, we need to identify the pathology in the brain, and the regions of the brain that are malfunctioning to produce these symptoms. 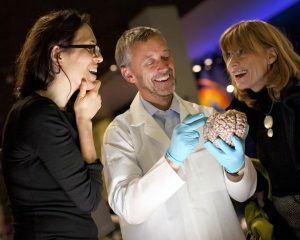 In our research group – the Neuropathology Unit, headed by Professor Steve Gentleman – my predecessors and I have been studying brain specimens from PD dementia patients under the microscope. We have found evidence for deficits in key brain chemicals – acetylcholine and noradrenaline – that we know to be involved in normal cognitive processing. We hope that this will help to focus the line of attack on dementia so that we can make a real difference to patients in their lives. As an early stage researcher, the aspects of my work that I have found the most rewarding and enjoyable are the ones that involve outreach to the general public. We are so honoured to host a yearly visit of over 50 PD patients and family members to tour our labs and the Tissue Bank facilities. I am always humbled by the passion that the wider PD community, largely due to the work of Parkinson’s UK, have for research. It is exciting for us to share our work with patients, but it is also crucially important for us to hear their feedback and suggestions for what they would like us to address in our research in the future. Their lived experience guides what we do and our motivation will always be to help make their experiences more manageable. We work in hope of finding a cure to this distressing condition. Bension Tilley is a second year PhD student in the Department of Medicine. Ben’s PhD studentship is funded by The Jean Shanks Foundation and the Parkinson’s research at the Tissue Bank is funded by Parkinson’s UK. Find out more about World Parkinson’s Day 2018, and how you can get involved. Professor Richard Reynolds shared insights into his team’s MS work in a live ‘Ask Me Anything’ session on Reddit. Unless otherwise stated, this text is licensed under a Creative Commons Attribution-NoDerivatives 4.0 International License. Images may not be reproduced without permission.